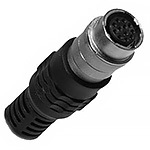 High Flex Analog video cables is flex and reliable high performance for your motion control and analog video applications. 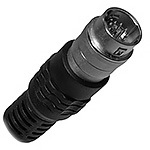 Depending on the configuration, connector options are available as HR10A series 6-pin（6 Pin Female Plug HR10A-7P-6S/ 6 Pin Male Plug HR10A-7P-6P）, HR25 series 8-pin（8 Pin Female Plug HR25-7TP-8S / 8 Pin Male Plug HR25-7TP-8P）, and HR10A series 12-pin（12 Pin Female Plug HR10A-10P-12S / 12 Pin Male Plug HR10A-10P-12P）,the other end can can be open with flying leads,or do with connectors DB 9pin /DB 15pin /DB 25pin / Open end / Female Jack HR10A-10J-12 / 12 Pin Female Jack HR10A-10J-12/ D-Sub / 6 Pin Female Plug HR10A-7P-6S/ 6 Pin Male Plug HR10A-7P-6P / RJ45 and custom connectors. .
Cable type 24 AWG x 12C (I/O) is available to flying leads. The pin-out/color code for flying leads is customer-specified to match your requirements. 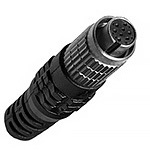 Twisted cable and non-twisted cable available,coxial cable and non-coaxial cable available.Standard cable and high flex cable available. Additionally, right angle options for connector orientation are available for 12-pin female or male end types and 8-pin female or male end types and 6-pin female or male end types. Lengths are standard and customized. This Hirose Cable assemblies are designed for industrial analog camera which with Hirose connector interface,this high flex can be used in drag chain system,millions flex life time. 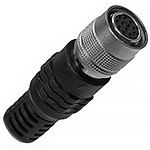 Hirose HR10 series connector can locked well with the coupling connector,this connector compatiable with the made in china alternative connector,this can save much cost.